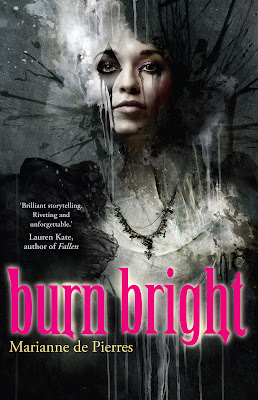 The Book Slooth: REVIEW: Burn Bright by Marianne de Pierres. Burn Bright by Marianna de Pierres is the first book in her new Night Creatures series. Retra lives in a world made up of mysterious and abundantly different realms. Retra and her family have lived somewhat happily in Grave, an oligarchic, corrupt society where the smallest infraction results in severe punishment. So when Retra's older brother Joel commits the biggest transgression of all; leaving Grave to live in the scandalous party kingdom of Ixion, the land of night; Retra is left without someone to talk to and a severe punishment that bends her will every day. Ostracized for being 'the girl who's brother left', Retra follows in her brother's infamous footsteps and make her way to Ixion in search of her brother. Upon her arrival in Ixion, Retra is confronted with a culture the complete opposite of Grave's. Where modesty is a scandal and you party till' you die, Retra must decide whether she can let go of her morals and be able to blend in, in order to find her brother and live a happy life. Personally, I felt that the cover was too swamped with all the different elements that they wanted to incorporate that it distracted you. Don't be dissuaded by the cover or the semi confusing blurb, Burn Bright is a heck of a ride that pulls you into a complex fantasy world within pages that can at sometimes be confusing. This book is one that you have to pay attention to and remember past details as it is always introducing new concepts that need prior knowledge for them to make sense. Although, Burn Bright is definitely a novel that is an original read that is fast paced and told with the skill learned from experience that de Pierres obviously has crafted over time. I found the inner dialogue of Retra to be accessible and allowed you to understand the complex workings of the world that de Pierres has created through child-like innocent eyes. If you are interested in fantasy or adventure novels, Burn Bright is the perfect novel for you, combining all these elements, well. I would recommend Burn Bright to girls aged 13-17, although, some guys might enjoy this. Thank you to Random House Australia for this review copy. I really loved how accessible this one was too. A fave of 2011 already!